Six years ago a client called me out of frustration. 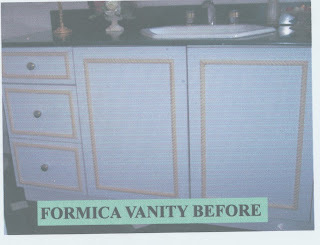 Her formica vanity was dated looking, and there didn't seem to be many options. To replace it would mean having a plumber come in and disturb the granite countertop, then remove the sink. 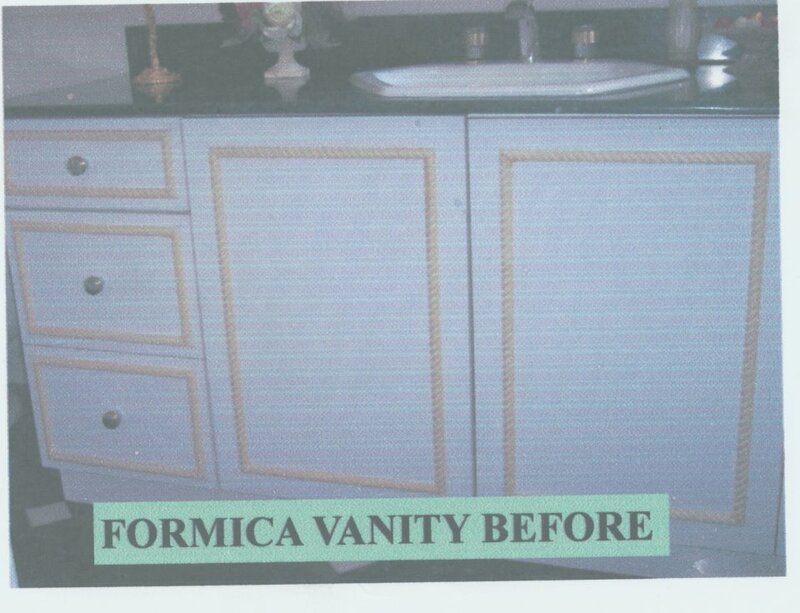 The old vanity would have to be taken out of the bathroom, dragged down the steps of her lovely home, and out into the trash. She did not want to endure the mess, or the expense. She asked me for any solution I might have. I showed her pictures and samples of other formica surfaces I had repurposed. She was hooked. So I created this "burl" finish by manipulating different shades of brown glaze over a medium yellow base. The client already had her carpenter install decorative braid molding on the doors and drawers. I "gold leafed" these moldings for added pizzaz. So remember, if it ain't breathing, it can be painted!